New flowers are popping up here and there throughout my garden. Plants don't follow a precise calendar but it seems at least some plants may be responding to the rain we received earlier this month by blooming a couple of weeks ahead of their usual schedule. I've been watching buds forming on my Echium handiense for a few weeks now and last week noticed that a neighbor's plant was already blooming. On Saturday morning I noticed mine had begun to bloom too so I knew it was a prospect for In a Vase on Monday. Other elements of the arrangement, including the vase itself, were a matter of pure serendipity. I met a friend for a belated birthday celebration on Saturday (her birthday, not mine). After lunch we toured a couple of secondhand shops and I found the wonderful glass vase shown here. A great buy for $16! While checking out my friend's garden later in the afternoon, I discovered she had a beautiful Bush Germander (Teucrium fruticans). 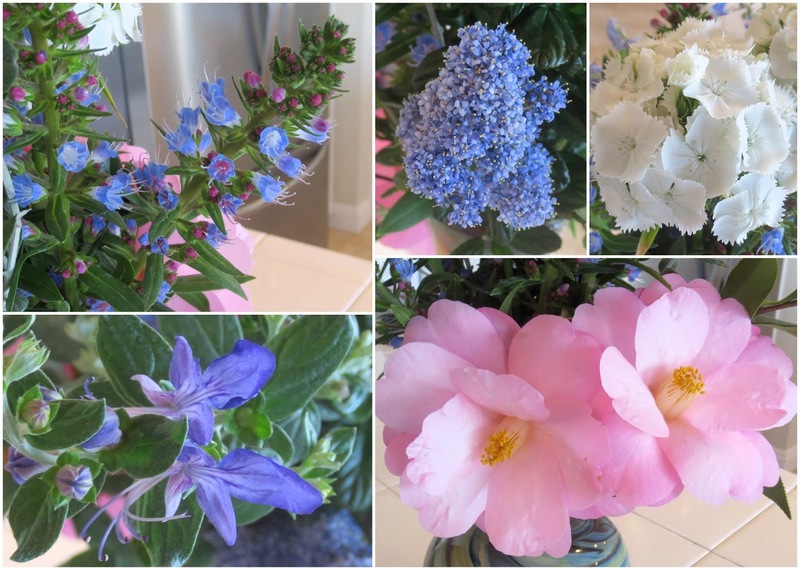 I begged a few flowering stems, as well as a couple of seedlings. 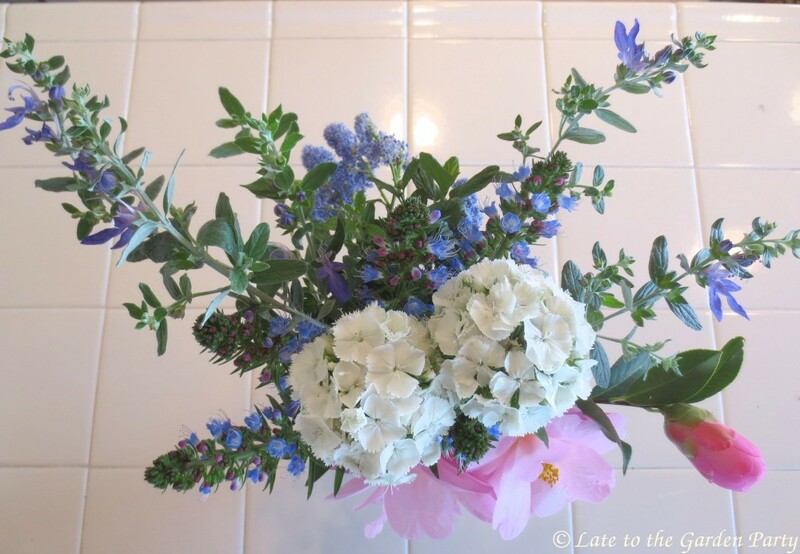 The flower color is a much deeper blue than the cultivar I grew in my former garden. Clockwise from the upper left: Echium handiense, noID Ceanothus, Diathus caryophyllus 'Cut Flower White', Camellia hybrid 'Taylor's Perfection' and Teucrium fruticans (possibly 'Compactum'). The Echium is considered critically endangered in its native habitat in Spain. I've never seen it in a garden center. My plant comes from my local botanic garden. 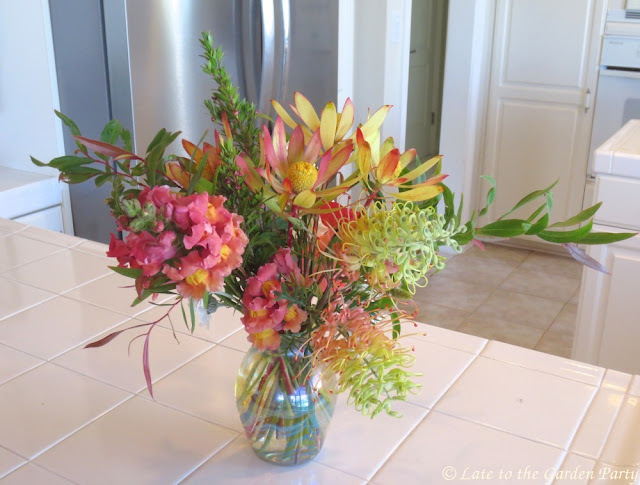 There were a few leftover flowers that didn't fit into my new vase. I popped these into a tiny vase. 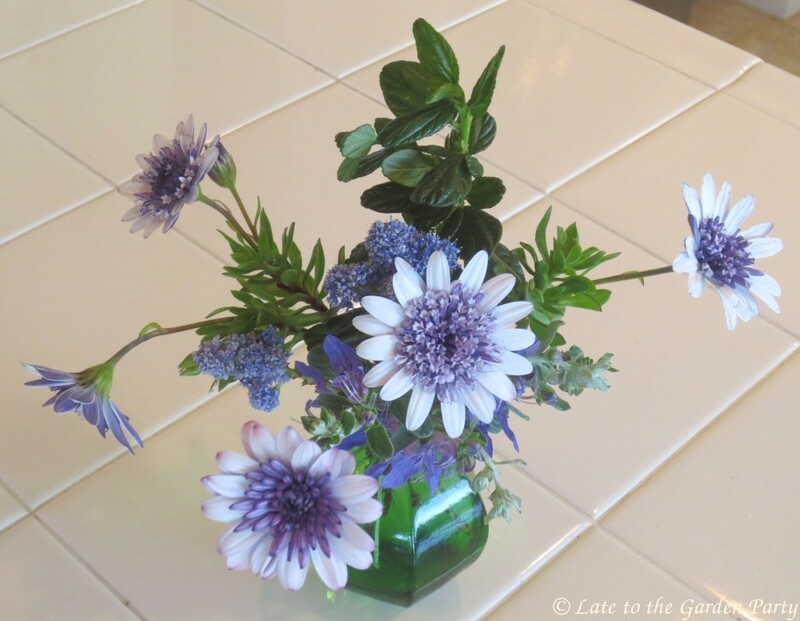 In addition to small stems of Ceanothus and Teucrium, these included several stems of Osteospermum '4D Silver'. 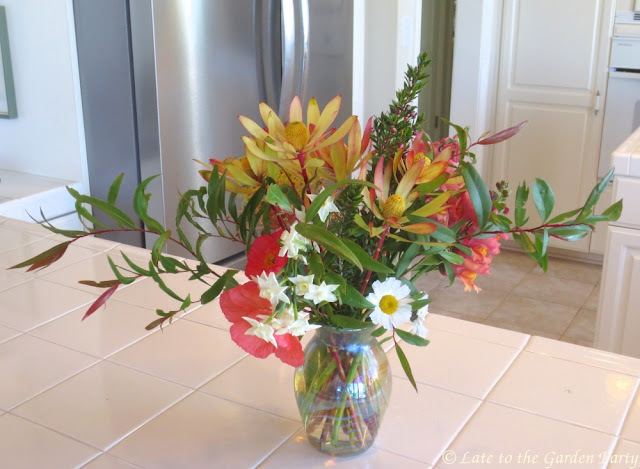 The snapdragons in my cutting garden provided the jumping off point for my second arrangement. The plants are already showing signs of rust, probably spurred by the warm temperatures that followed the persistent rain we enjoyed the week before last. 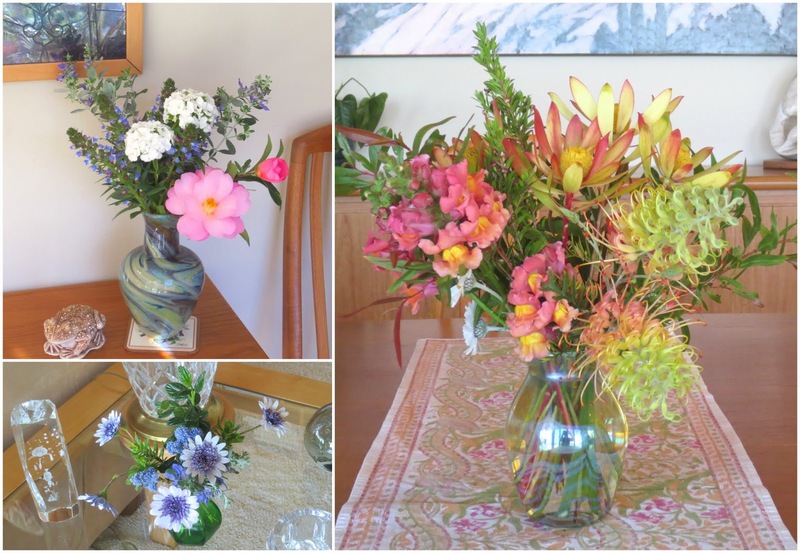 My vases assumed spots in the front entry and the dining room table as usual. The tiny vase of leftovers landed on a side table in the living room. 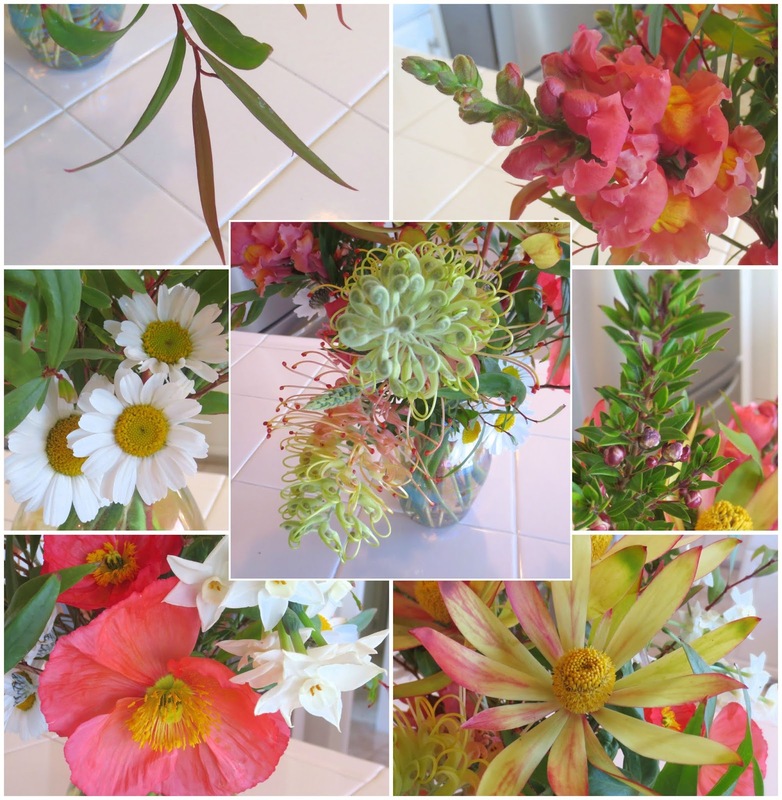 For more Monday vases, visit Cathy at Rambling in the Garden. Such an abundance of lovely flowers Kris and I love your swirly patterned vase. I have never heard of that echium, it is a beauty. I agree the teucrium is a particularly deep blue, lovely. The snapdragon is a gorgeous colour too. I'd never heard of this Echium either until I ran into it at one of my local botanic garden's plant sales. My first one reacted badly when I tried to relocate it after its first year in the ground. My current specimen had gotten taller than I expected but I'll trying pruning it into submission rather than relocating it this time. Great vase find! As always, your vases are full of spectacular beauties. Last winter, I stood by a 'Taylor's Perfection' for quite a while debating about bringing it home. Such a pretty bloom. 'Taylor's Perfection' deserves its name, Peter. My only complaint is that it drops its petals rather quickly when cut but then no Camellias last very long in a vase. What a wealth of beauty! I don't think I've ever seen Germander flowers and that blue is wonderful. What a boost it gives to the other colors. Teucrium chamaedrys (wall germander) blooms for us here as well but those I've grown get ratty after a couple of years even with regular trimming. I'm hoping this one will perform better. Beautiful! Beautiful! Such lovely springlike colors. Thanks Cindy! It felt like spring here last weekend with temperatures reaching 80F. I wonder if your vase is Venetian glass? Souvenir of a happy holiday? Maybe but it couldn't have been too happy a holiday in that case in that it ended up on a shelf in a secondhand shop! Oh the blue accents in the first vase are especially lovely, Kris, especially when seen next to the glossy green foliage. I wonder why echium has become endangered in Spain - do we know? It feels like spring is already creeping up on us, Eliza, but then it does arrive early here. We can probably expect some weather ups and downs for awhile yet, though. This weekend temperatures hit 80F but we cooled today and there's more rain in the near-term forecast. It is so soothing to see all of these flowers. Love the blues. Happy IAVOM. I'm glad I can add some color to your white/gray world, Lisa! Your Peaches and Cream Grevillea will always be my favorite thing in the garden. Oddly, I have Dianthus here (for winter annuals) I am really enjoying and there are Snapdragons about. Love the Osteospermums, am about to try Calendulas and Bachelor Buttons here. I think I commented that I had figured out the comments..hadn't realized how to follow them on blogspot. I've no idea how one follows comments on Blogspot, Amelia, but I'm glad you figured that out. I guess I should look into it to see if I can facilitate that somehow. I really shouldn't be buying any new vases, inexpensive as they may be, in that I'm going to have to store most of them in a box in the garage for 4-6 months while we remodel the kitchen and other parts of the house beginning in spring (or at least I hope we'll be off to the races in April or May). I already gave some of mine away but somehow managed to acquire 3 more since the holidays. Aw, everything is so gorgeous. Beautiful new vase Kris--nice find! At that price, I felt as though they were giving the vase away, Susie. I love the sunny vase arrangement (as usual) but I’m so happy you found a great new vase too! I found this "new" (secondhand) vase in the same store I found the china vase of a woman's clasped, and well-manicured, hands a year ago. It'll be on my list to visit every time I get to downtown Ventura (which is, at most, once a year). My garden does have a plentiful store of sunny colors, Cathy. I guess that's a reflection of our climate. Oh Annette, I think we just have different views of what's "exotic". There's so much those of you in colder climates can grow that's impossible, or virtually so, for us to grow here. 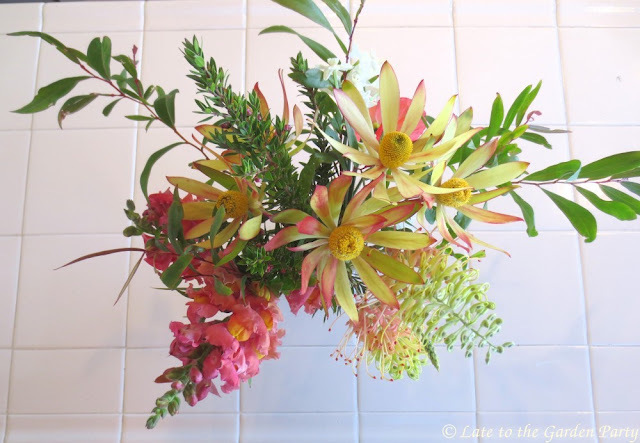 Tulips, peonies and, yes, forsythia are exotic to my eyes! I like the blue and white in your lovely new vase. Snaps will be one of the first things I sow. I was planning to wait another couple of weeks but I might get itchy feet. We are promised a cold snap this week and, of course, we know anything can happen in March or even April. Do you grow your Iceland poppies from seed? I don't have much luck with them. As the last of the Camellias dropped out of that first vase, it's entirely blue and white flowers now, Alison. It looks better for that change too. Iceland poppies don't last long here so I've never bothered trying to grow them from seed. I plant plugs and cross my fingers that warm weather will hold off long enough to get some blooms. 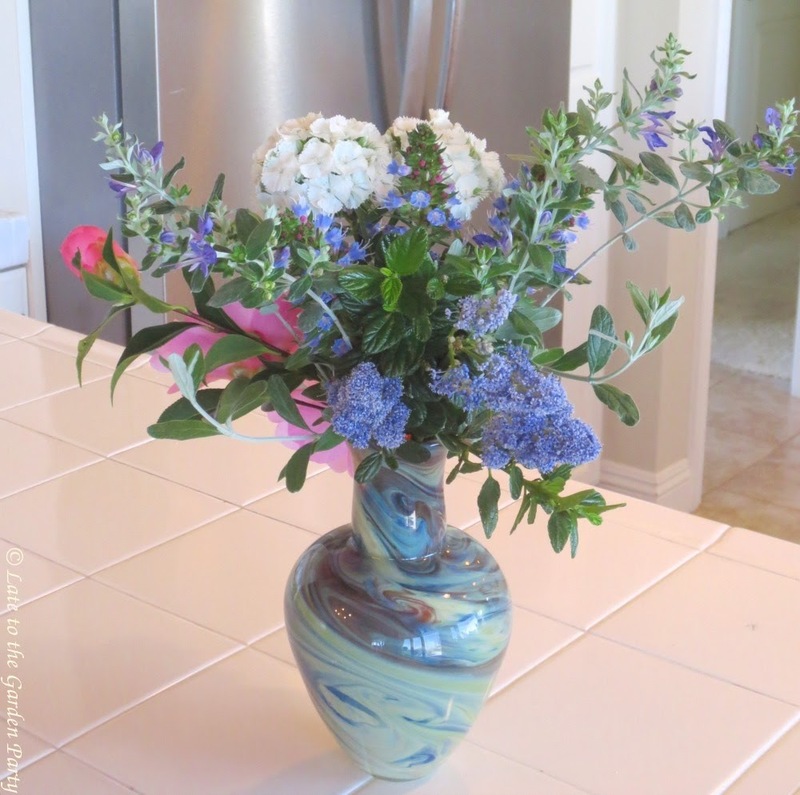 I agree that your new vase is just perfect for blue and white flowers. 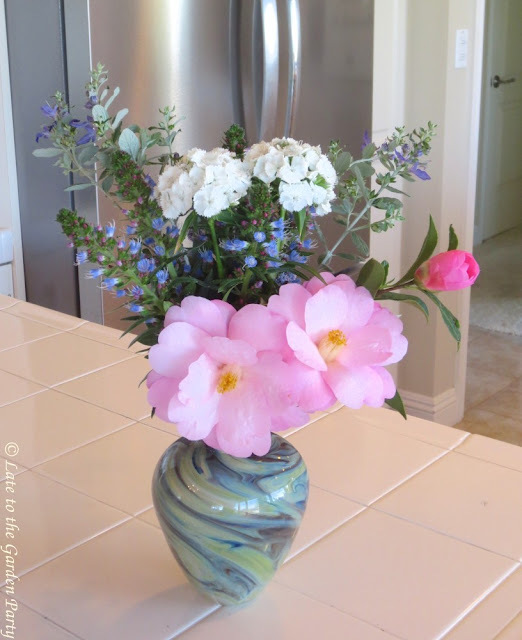 Just how fortunate you are to have flowers for three vases. Happy IAVOM. That first vase is stunning! I'm particularly enamored of the Camellias...because they are favorite flowers AND because I can't grow them here in Wisconsin. If I recall correctly, Beth, that Camellia was the first new plant I added to my current garden. It'll also probably be the last Camellia I plant here. I love them too and I had several of them in my former garden, just 15 miles away, but conditions here, combined with the drought and warming temperatures, make this environment far less hospitable for them than my prior garden. I always enjoy seeing your Echium handiense; I also have a small one in a pot but it isn't very happy. All your arrangements are so full of colour and beautiful forms. I'm sure you are pleased to have had some rain. Echium handiense may be bit persnickety about its placement, Christina. I originally had one in another bed and, while it survived, it didn't thrive. This one has done almost too well in its position - it's considerably taller than I expected.